"This Willy's has an interesting history. Originally purchased by the Federal Government in 1946 to be used as a motor pool jeep at Moffett Field Naval base in Mountain View, California. This CJ has some characteristics of the M38 utilizing the one-piece windshield, spare tire mounted on tailgate and blackout markers set into the grill. This unit was dressed in Navy gray during its time at Moffett. In 1959 this Willy's was slated for demolition, but it was saved by my grandfather and my dad. It was in 1960 the Willy's found its way hitched to the back of my Grandfather's Dodge pickup and headed for the south gate leaving the base. Once in the family it was used for several deer hunting trips abroad. The Willy's was painted many different colors over the years but maintained its mostly stock appearance. As a boy I rode around with my Dad all over the Bay Area as it was considered a real treat to use the jeep. I learned to drive in this jeep when I was older and was responsible for burning up the engine while clearing brush in a field. 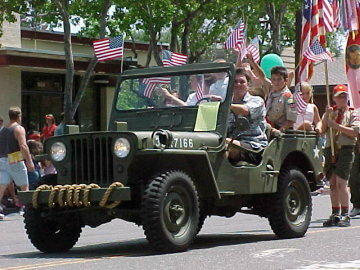 The jeep sat idle from 1981 to 1998 when I found Mike's Military Motors in Santa Rosa, California. The complete restoration was finished in less than one year now dressed in Olive Drab, presumably its original color. This jeep will stay in the family and passed to my son when his time comes. Restoration performed as a tribute to my father Gil Lamica who died in November 1998."